The Royole RoWrite wordpad (RO-F930-A) is a tablet-like device released by Royole by the end of 2017. 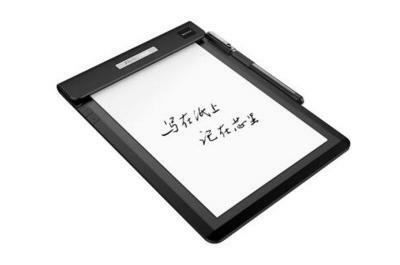 We originally thought this was an OLED tablet but eventually it seems that this device only includes a touch sensor (apparently Royole's own flexible sensor) that can accept pen-input, onto which you place a regular (A5) paper to write on. The RoWrite includes memory for about 40 notes, and it can transfer these to both iOS and Android devices (via Bluetooth). The RoWrite started shipping in China towards the end of 2017 and is now available globally for $129.99.